Vintage Fender Strats, Custom Shop & Boutique S-types, Guitar Parts, Auctions & Sales! This week's feature has me going just as gaga over the website as with the guitars! Michael Tuttle is a top builder and guitar player who worked for Valley Arts and Don Grosh prior to doing his own line. His clients include many top session musicians, and models are based on standard Fender platforms, with beyond standard touches. The '54 Classic S series embraces several finish and pickup configs of which one must peruse at the website. Tuttle also does custom work and repairs, and has a reputation as a fretwork wizard. For a bit more overview, click here for a GP review on Tuttle's hollow Tele type models. Although this may seem like just another vanilla clone Friday Strat (yawn...), the real pleasure begins when you step into Tuttle's website at www.bestfrets.com . Make sure your speakers are on so you can hear the tonefully exquisite guitar playing. Besides the site opening music, several primo audio clips are also featured for the various models-- along with amp and player specs provided. Finally-- a guitar maker site that puts its tones where it's mouth is! While listening, you'll wanna take in the photo galleries. The sleek & easy to navigate site both promotes and reflects the elegance of the sounds and instruments featured throughout. All guitar builder websites should be this clean and aesthetic. Best of all, it's totally B.S. free! GuitarAdoptions.com is a Michael Tuttle dealer with other toneful, hi-end gear lines and savvy personal service as well. Be sure to visit their website too! Do we promote your brand, or help sell your gear? Feel free to tip. 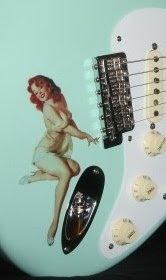 Find Prewired Loaded Strat Pickguards, Pickups, Bodies, Necks, Wiring Mods, Pin-up Decals, Skins, DIY Tips and more! Do we promote your brand, or help sell your gear? Stratocaster Guitar Gear Blog. Gear and artist reviews, Strat upgrades, mods and DIY guitar parts. Featuring Fender Strat-Stratocaster auctions, for sale listings, vintage, custom shop gear, pedals, amps, DIY and parts. Site and content, © 2006-2013 JP Holesworth unless otherwise noted. "Fender", "Stratocaster", and "Strat", are registered trademarks of Fender Musical Instruments Corporation (FMIC). Stratoblogster is in no way affiliated or associated with FMIC. Please Note: Articles on this website are for informational, educational or humorous/satire purposes only. This is a personal web log, and as such, it contains opinion, bias, conjecture and ridiculous wackiness. I make no guarantees as to the accuracy of the information published here. I do not claim ownership of images posted in this blog. Let the buyer beware this blog also contains affiliate, sponsored-paid links, and I take no responsibility for any purchases made through such links. Note: Many photographs presented in this blog represent eBay listings, and as such are the property of the original photographers. As we are helping to promote those listings and sellers, we usually do not include additional photo credits besides a current seller link. Please contact us if there is some issue with listing content or photos, which we will be happy to revise or remove accordingly. Thank you! Banner-header image: "Fracturecaster" by Phil Sylvester at http://www.pheoguitars.com/ Portland, OREGON. This is a fully functioning, playable Strat.